One of the fanciest occasions of the Queen's year often passes by unnoticed, as we rarely get glimpses from inside. The event is the annual Diplomatic Reception at Buckingham Palace for members of the diplomatic community, hosted by the Queen in November or December and usually attended by a group of royals - all kitted out in their most formal white tie dress, tiaras and all. 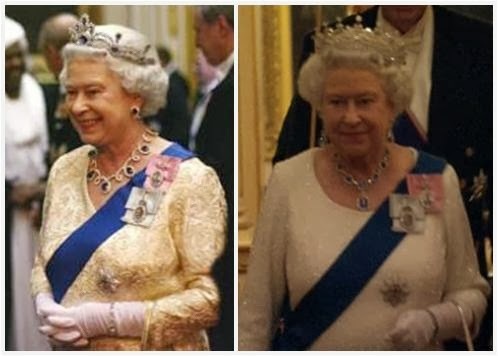 It's been several years since we've had a good look at this event, but two recent years were occasions for the Queen's sapphires to come out and play: the Modern Sapphire Tiara paired with the Dubai Looped Sapphire Demi-Parure in 2005, and the George VI Sapphire set paired with the Girls of Great Britain and Ireland Tiara in 2006. Since the event is white tie, she also wears her royal family orders, and her Garter Star, Riband, and Lesser George. The event is catching a whole lot of interest this year (2013), since it was announced that the Duke and Duchess of Cambridge would be in attendance. This is the first public tiara appearance for the Duchess since her wedding day. The Daily Mail has pictures of their arrival, in the car. Interestingly, the Duchess is wearing the Lotus Flower Tiara (also commonly called the Papyrus Motif Tiara). Originally from the Queen Mother's collection, it was last known to be in the possession of the late Princess Margaret, and now it appears to have come back to the main royal line after Margaret's death - something I had hoped for, since it's a personal favorite of mine. (Originally I was quite surprised to see that she was already wearing a second tiara, but multiple people swiftly pointed out to me that the Halo Scroll Tiara from her wedding day is with an exhibit in Paris, so a swap was necessary.) Kate also wore a pair of diamond earrings from the Queen's collection, loaned to her and first worn in the United States when she and William were on their tour. A second look at this evening's pictures from Pop Sugar shows that she isn't wearing the Queen's own royal family order, meaning she likely hasn't been awarded the honor - yet. Update: A documentary crew captured the 2015 reception on film, click here for a review.